The subject matter discussed under this heading concerns an interesting feature in European history, insofar as other Europeans did not usually attack German territories, but Germans militarists steadily built up their military might, waiting for the right moment , when their neighbours were weak, to launch their attack. It was not a force to which traditional knightly valour or courage can be ascribed. Characteristics of German militarism include falsehood, hypocrisy, betrayal, arrogance, a lack of guilt for perpetrated crimes, a lack of humanity, perpetration of robbery and pillage, as well as other such characteristics which can be ascribed to them. When weak they were characterised by servility, a good example can be East Germany. The militarists here were great supporters of Hitler, but they very quickly became great supporters of hard line communism. Only power and strong hand built up their respect. At the time of the conquest of the Prusians in the 13 century with full approval of Christian Europe the era of the building of German militarism began. 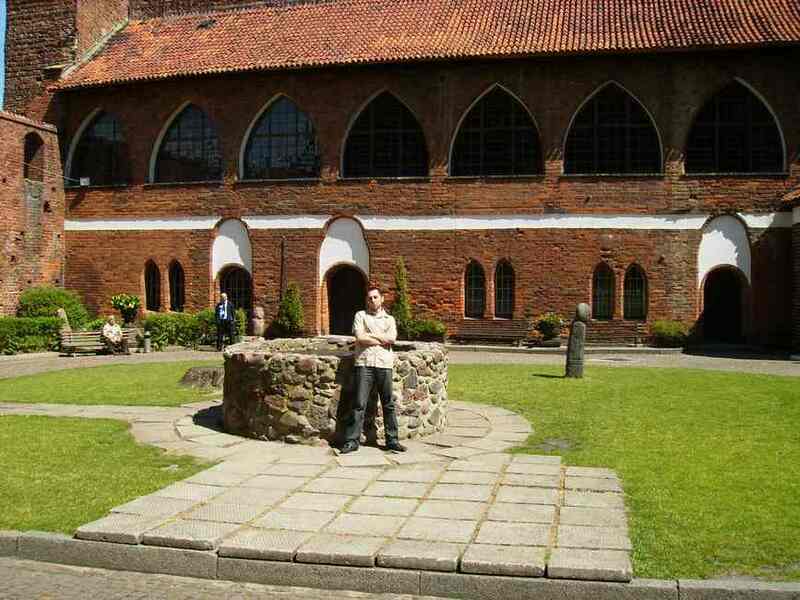 This took place under the German Teutonic Order of the sign of the black cross. The whole Christian idea of this Order was well described in the 16 century by Andrew Krzycki, archbishop of Gniezno. There are three crosses, a red one on which Christ was crucified, a white cross was hung next to Christ a robber begging for forgiveness for his sins; and the black cross on which was crucified a robber blaspheming against Christ - it is this cross which was worn on the cloaks of the Order of Teutonic Knights. The Order was originally set up to ensure the safety of the pilgrims to the Holy Land and the Tomb of Christ, and even here it lost its Christian ideals. At the end of the 12 century the Order was forced to leave Palestine, and at end of the 13th Syria, to establish its headquarters in Venice. The foundations of the rules of Christian Order regarding poverty and servitude had nothing in common With the Teutonic Order, and this became even more evident when in 1230 the Order came to the Prus land. Without doubt when the Order was founded, and also later, it became arm of the Papacy, and also had the support of all the Christian monarchs of Europe. Because of this it had access to unlimited material resources in the whole Europe. However the Order needed a military base in which the local subjected population, deprived of its social structures, was needed to maintain and service the Order. Because of this, after the conquest of the Prus land the colonisers began the building of a feudal state belonging to the Order. However this did not suffice for the German knights of the Order who suffered from the incurable illness of this European nation which lasted for centuries, until recent times, of the policy of “Drang nach Osten”. Its aims were the conquest of the next peoples in the Baltic hinterland, in Lithuania, Latvia and Estonia. The Teutonic Order is settled in Transylvania (Hungary). The expulsion of the Teutonic Knights from Transylvania. 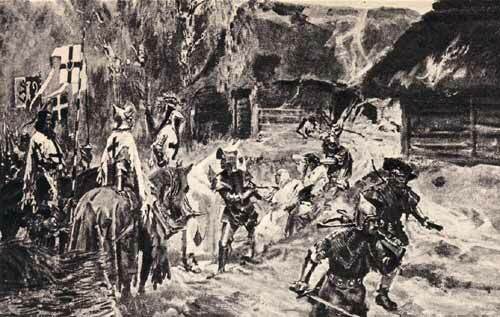 The Teutonic knight Conrad von Landsberg arrives in Poland; the building of fort Vogelsang. The granting of the lands of the Polish Chelminski province to the Order as subjects. The Order attemps for the Pope to authorise falsified grants of lands. The beggining of the conquest of the Prus land. 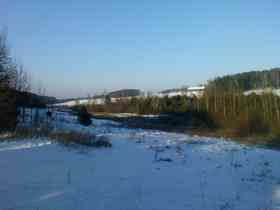 The conquest of the Prus land. The first uprising of the Prusians. 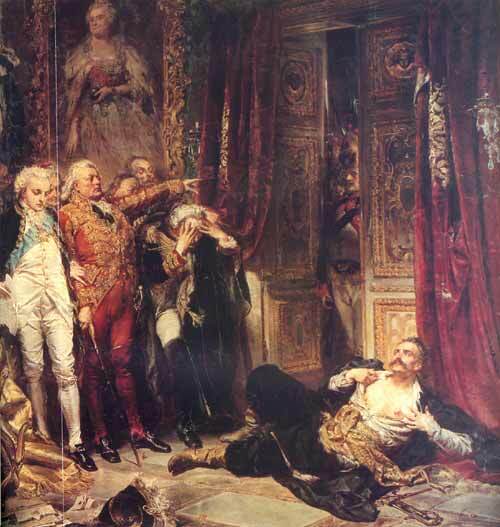 The conflict of the Order with the Polish Prince Sviatopelk of Pomerania. The beginning of armed conflict with Lithuania. The second uprising of Prusians. The final conquest of Prus land. The betrayal of Gdansk (Danzig) to the Order. 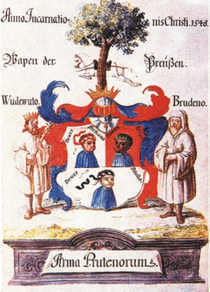 The whole of Gdansk Pomerenia in the hands of the Order. The headquarter of the Order is moved to Malbork from Venice. The beginning of the war between Poland and Teutonic Order. The expedition of the Order and of John, king of Bohemia to Lithuania. 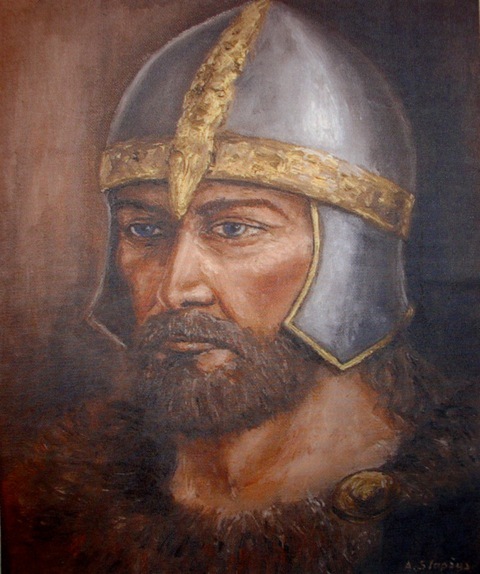 The Order robs and pillages the northern Kujawy province and occupies the Dobrzynnska province. 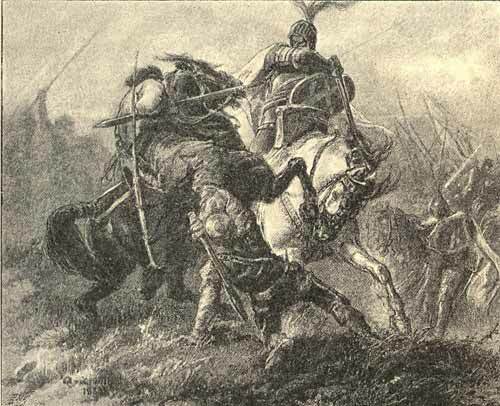 A new attack of the Teutonic Knights on Kujawy and Greater Poland. Two invasions of the Order into Polish heartlands. 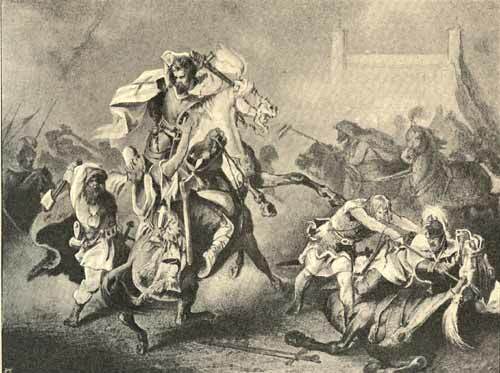 The battle of Plowce with king Vladislav Lokietek. 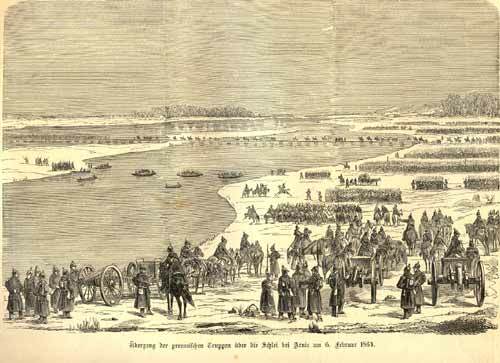 The seizure of the whole Kujawy province by the Order. Armed invasions of the Order on Lithuania. Battles for the Zmudz province. The Prusian and Polish knights of Chelminski province form “lizard Society” for defence against the lawlessness of the Order. The beginning of the Polish-Teutonic Order war. The great battle of Grunwald and the destruction of the Orderand its European allies by the Polish king Vladislav Jagiello. 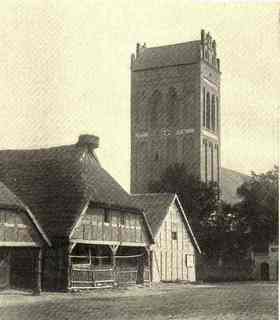 In the above chronology a small pause is due for short summary of the method of operations of the Teutonic Order. At first its operations were dependent on falsehoods, hypocrisy, forging documents, murders with extreme cruelty, constant invasions, and above all lack of any humanity. The Teutonic Order had nothing in common with knightly deeds and the knights code of conduct. 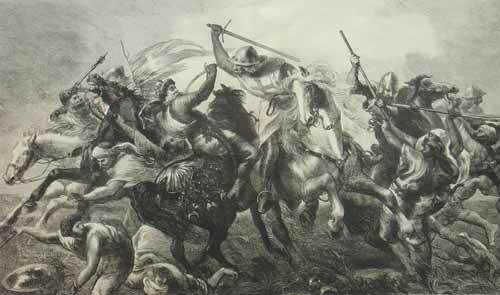 The defeat of the Order at battle of Grunwald, as well as the constant invasions and attacks on its neighbours destroyed the Order economically, but not to the extent that it lost its existence in Prusia. The support of the Papacy, although it was lessening, still meant that the legal presence in the conquered territory was recognised. Because of the new unfavorable conditions for the Order, the native Prusian population was even more subjected and exploited. By the turn of 14 and 15 century Old Prusia became German Prussia and its rulers only propagated cultural and language unity with Germany. After the battle of Grunwald the situation in Prussia was dependent on the political situation. The Order was forced to return the provinces seized from Poland, but this did not mean that it had given up its aggressive policies. The “ Hunger War “ between Poland Lithuania on one side, and the Order on the other. The “ Retreat War “ between Poland/Lithuania and the Order. War between Poland/Lithuania and the Order. 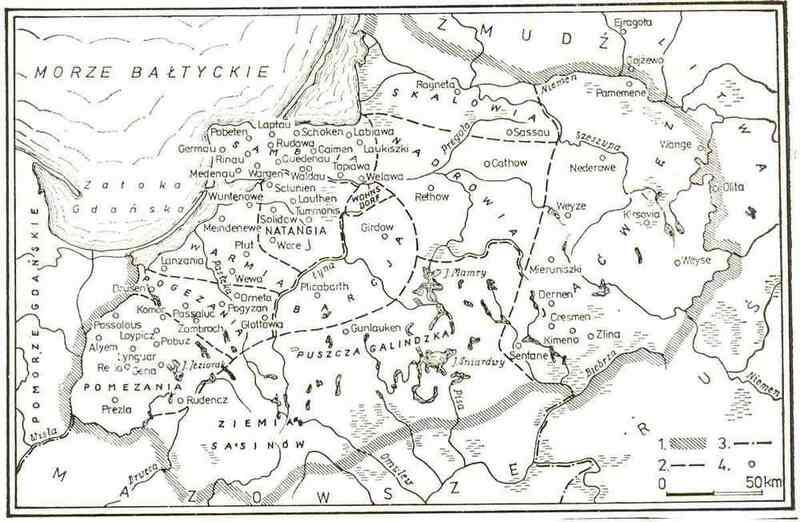 The invasion of the Order on Greater Poland and Kujawa Provinces. 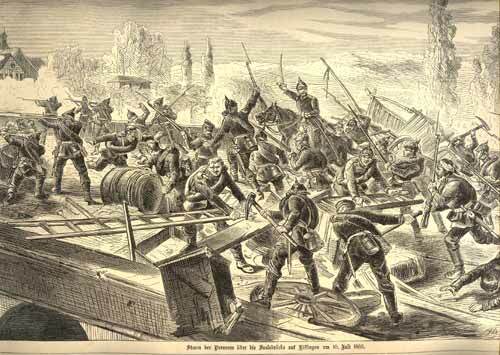 The defeat of the Order in the Baltic Inflanty provinces at the battle of Wilkomierz. The Thirteen Years War. 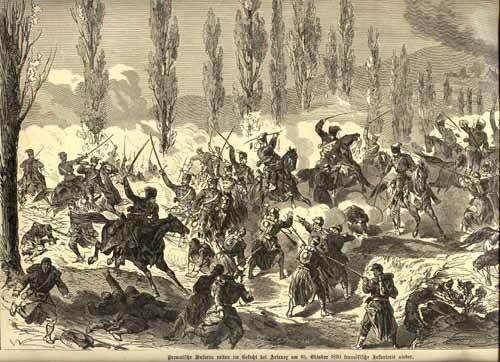 The Polish Crown together with the Prus and Polish knights rages war to recover the lands seized by the Order. In spite of defeats in decisive battles and attempts at transplanting the Order to territories from which they could fight the Turks, diplomatic manoeuvres with Papacy and growing links with German states strengthened their presence in the former territories of the Prus people. In the year 1496 the Order, in secrecy, took the decision to give the position of the Grand Master of the Order to the Saxon prince Frederick of the house of Wettin so as to legitimise their presence on the Baltic and strengthen their ties with Germany. Endless negotiations were carried out with Poland, whilst at the same time the Order made ready for war. Preparations for war were also carried out in German territories. 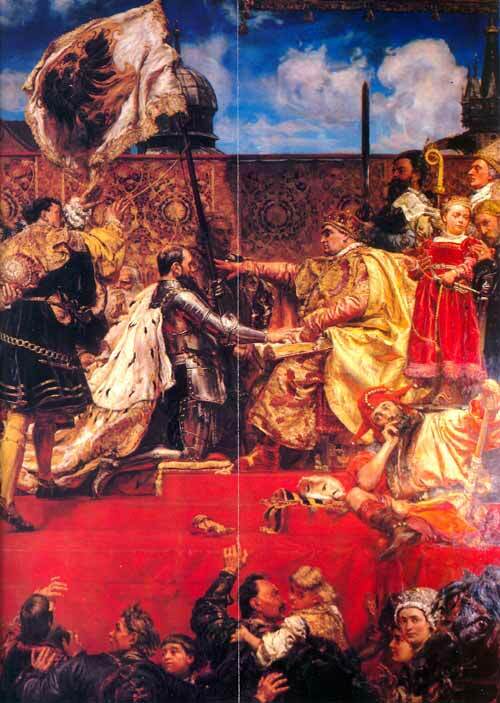 The war of the Grand Master of the Order, Albrecht von Hohenzollern, against Poland. In the Prusian territories of the Order the process of changing administration from religious supervision to a lay territorial state was began. At the same time the reformation ideology, evangelical in nature, tied the Order even more closely with German Reich. A moment of subjugation for the Order and false swearance to the Polish King. The Prussian Fealty-the Oath of Subservience by the Order to the Polish King. From that year the Elector of Prussia is George William-he united the Principality of Prussia with Brandenburg. The son of George William, Frederick William started building up absolutism in Brandenburg and Prussia. The basis of the new system were taxes, a regular army and the alliance with the colonising gentry in Prussia - the junkers. A new secret Council was created, which dealt with military matters,foreign affairs and finances, as well as a Supreme War Council. Prussia formed an alliance with the Swedish King Carl Gustavus X . During the Swedish invasion of Poland it actively backed Gustavus X. In 1701 Frederick I became the King of Prussia.The Prussian Kingdom lasted between 1701 and 1918, and in reality was the Kingdom of Germany, from 1871 forming 2/3 of the whole German empire,taking its name from the Ancient Prusians who had nothing with the German Prussians. The era of the building of the great German militarism began: it was said that “the army has it own state”. 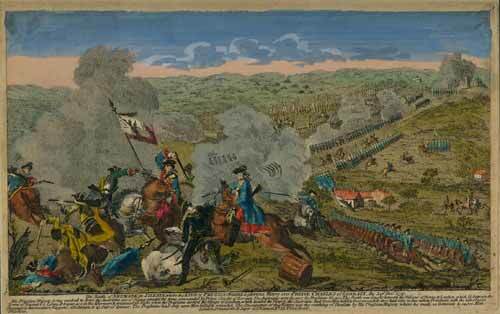 The defeat of Sweden in the Great Northern War (1700-1721) gave Prussia control of Southern Baltic. This was also a period of the rise of colonising Prussian aristocracy, the basis of the Prussian militarism of the so-called Junkers who ruled the army. In the year Frederick II became King of Prussia. The first war with Austria over the control of Silesia. The second war with Austria for the control of Silesia. The third war with Austria for annexion of Silesia. The first partition of Poland takes place on the suggestion of the King of Prussia Frederick II, together with Russia and Austria. Russia did not take long to be convinced as the ruler of Russia, the Tsarina Catherine II was a Prussian from Stettin. The second partition of Poland. Poland is unscrupulously “thrown out” of Europe. The third partition of Poland. For the next 125 years Poland was erased from the map of Europe. Austria, with the Imperial Habsburg dynasty, had sovereignty over all German provinces. A political conflict took place between Prussia and Austria: the aim was to get rid of the Austrian hegemony over the German provinces and transfer it to Prussia. The instigator and promoter of this policies was Otto von Bismarck. War between Prussia and Austria for the control of Prussia over the German States. 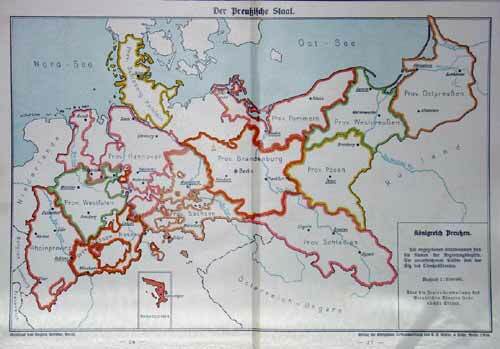 The aim of starting the Franco - Prussian war was the total unification of Germany. The main instigator of this policy was Otto von Bismarck. Winning the war against France led to the complete unification of Germany, the result of which was the rise of the military power of the Prussian junkers in Europe. 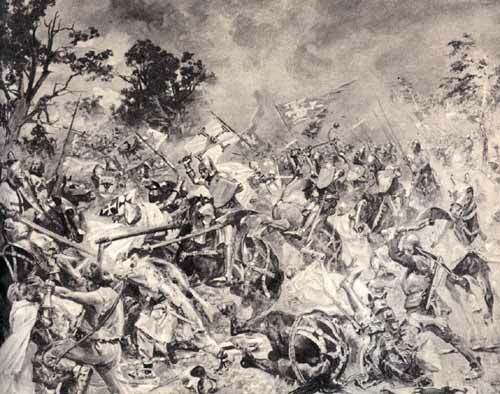 The Franco - Prussian war. Map printed in 1912 in Berlin. The Austro - Hungarian Empire of the Habsburgs declares war on Russia. Almost immediately Germany declares war on France. For the first time the Germans use a weapon of mass destruction, poison gas. The Germans took the initiative on all the battle fronts of Europe. It was the intervention of USA forces which led to the defeat of German militarism. Thanks to the Treaty of Versailles on 26th July 1919 Poland and other countries in Central Europe liberated themselves from the German yoke. 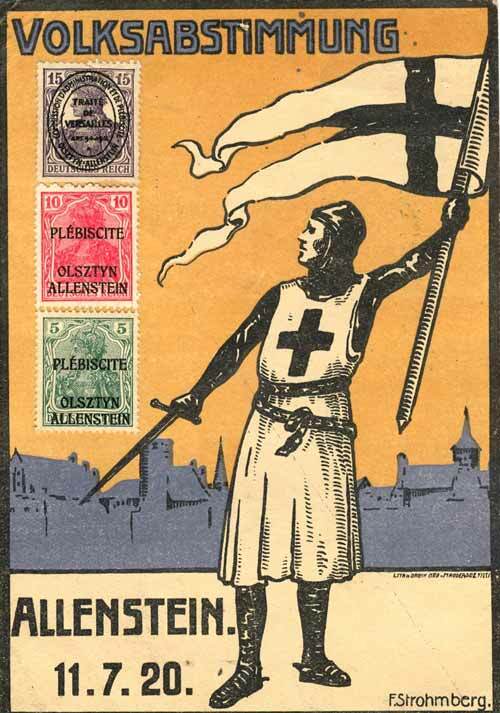 The way in which the plebiscite propaganda was carried out by the Germans. The Germans falsify the plebiscite vote of the disputed territories with Poland of Eastern Prussia and Silesia. The annexation of Austria with the aim of uniting the German speaking peoples. The brutal aggression of the German military on Poland started a new world war, in line with the old adage “Drang nach Osten”. A new partition of Poland was undertaken, and for the next five years the whole of Europe was the scene of the most bestial war started by the German Nazis possessed by the slogan “Deutschland uber alles”. TERRIFYING EXAMPLE IS TO BE CREATED FOR THE WHOLE OF EUROPE. The extermination of the population was carried out on a mass scale, just as 700 years earlier during the conquest of native Prus peoples. Once again the military intervention of the USA led to the defeat of German militarism and helped to destroy the German Nazis war machine. The above is not lecture on history, but only a chronological presentation of course of events of the last 700 years in which the main actors were the Germans possessed by imperialist expansionism. The flags from Wawel Castle (Poland) taken at Grunwald in the hands of German Nazis. Conrad Adenauer an honorary member of Teutonic Order in 1957. The above chronology is based on historical facts.However, history is written according to political needs, by historians of specific political options, according to the needs of their countrymen: in every country history is falsified, and particularly in Germany. For these reasons we lack truthful historical records and their veritable analyses. A nation convinced of “Deutschland uber alles” was subject in the Second World War to a terrible defeat and humiliation. It was not ready for this,victory was thought certain. For German politicians this was a problem difficult to resolve. Normally in a crisis emerge politicians who can provide an idea to uplift a nation from such marasm. 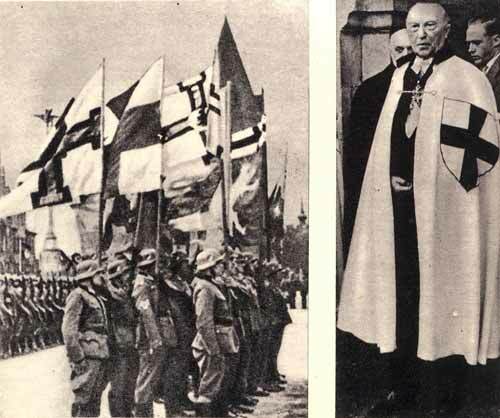 Such politician was Konrad Adenauer, but as can be seen above, even he was deeply immersed in the tradition of Teutonic Order, which over the centuries gave birth to a series of criminal wars, germanisation, extermination of Europe nations. 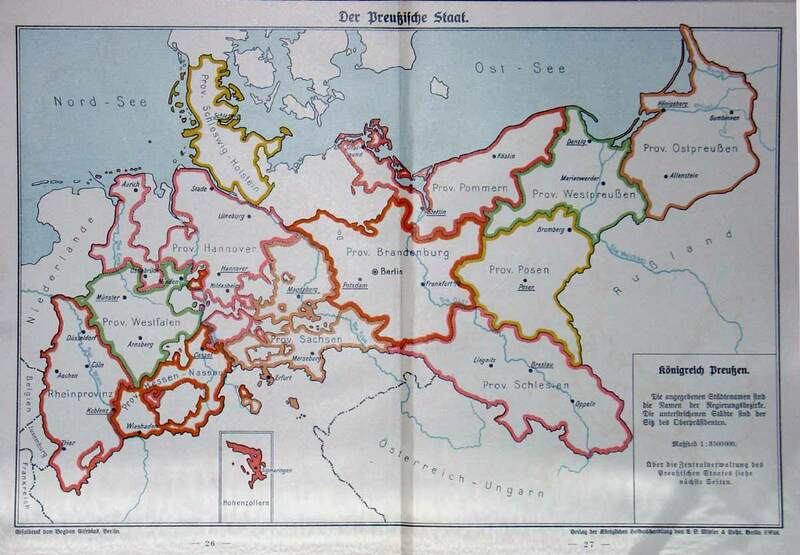 THESE MAPS ARE SHOWING EVOLUTION STAGES OF THE GERMANIC EXPANSION, UNDER PRUSSIA NAME. The slogan or the mirage, which Konrad Adenauer sold to the Europeans, was the creation of the European Union. A very great idea, if not for the fact that the defeated, slowly but systematically have began implementing the politics of the “German State interest. the above chronology of events demonstrates what these needs are. With great, as usual, thoroughness, patience, and without caring how long it takes, German expansionists aim for their realisation. Ever more clearly it can be seen that there is no humility for the bestialities they carried out in Europe. German militarists supported Hitler’s crimes and politics until the war was seen to be lost, to-day they feel they area victimised nation. “ Uber alles” is still alive and kicking. Poland is the first country which stands as a barrier to traditional Germany imperialist, expansionist ideas. It is discernible that in Poland, for the last 20 yearsof post-communism, as well as in its stay in the EU, the signs are that Polish Culture will to end of 21st century. The current IV German Reich is still immersed in its traditional “State Interest” politics and is well prepared to take advantage of the right moment to realize these German “State Interest”. A moment of weakening of the world position of the USA, and what result from this in Europe as well, a crises and chaos in the EU, would be an ideal time for Germany to assert its power from all alliances or European Treaties. The question is only, when? The rest one can only imagine. Polish foreign policy is not based on Polish State Interests. 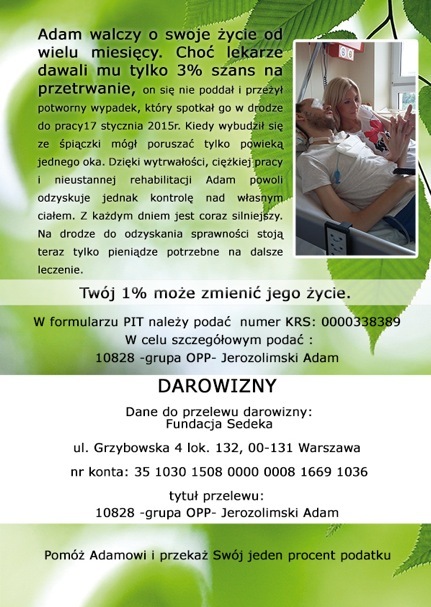 The world lives on politics, but Poland on love. We are now in the year 2009.